Once you retrieve the Stone and the Flower, you'll want to head back to Kuro. Unfortunately, every single idol at the Ashina Castle area has been blocked off. Except for the Abandoned Dungeon one. Travel there and start your way back up to the dojo where you fought Genichiro. Upon reaching the area, you'll notice a dialogue between Kuro and your father. After the cutscene, you can approach your father and he'll give you an ultimatum. After that, your father will call you a bunch of really mean names and the fight will begin. 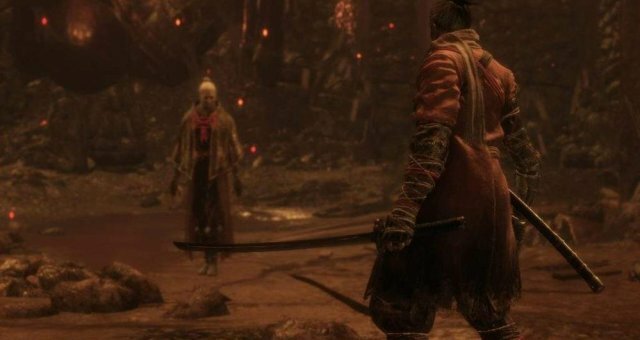 This will work relatively similar to the Genichiro fight as the Great Shinobi will have both melee abilities and ranged abilities. 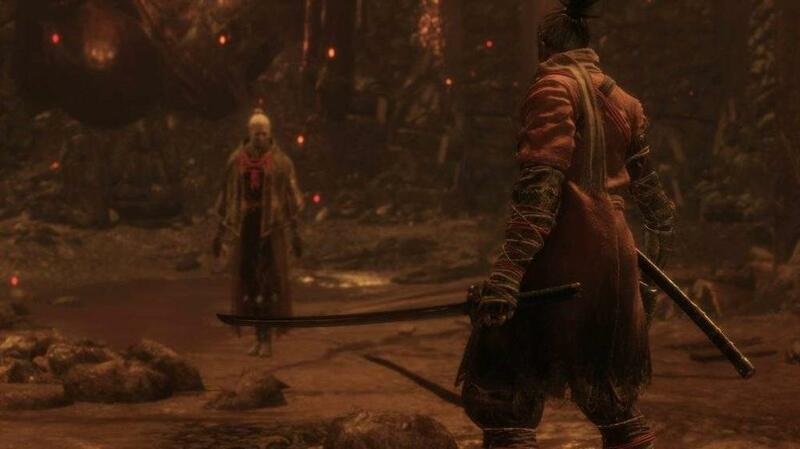 I actually beat this boss on my first go around using the exact same methods for Genichiro. You'll want to be parrying a lot and building up his posture damage. Stick to his back and keep slicing. Remember that his weapon will flash bright whenever he is about to attack, so stop slicing and block. At certain intervals, he will leap into the air and throw two shurikens at you. Easy to deflect so long as you've spec'd into the projectile block in your skills tree. His other ranged ability will throw a tiny bomb that stops you from using your gourd. This is really telegraphed. He'll kneel down for a brief moment before throwing a tiny bomb in the air. The area-of-effect is so small that you can literally just step-dodge but if you want to be careful, you'll want to run away instead. The best way to force him to use only melee abilities is to shove him into the corner. I chose to block him into the door and continually wail on him there. He hardly uses his gourd negation ability and his shurikens never happen. At this point, he'll add a couple new abilities to his roster. At random intervals, he'll chuck a smokebomb down at his feet and then jab into it. Simply run away whenever this happens. The ability takes so long that you should have enough time to just walk out of it. Right after his jab, go right back in for some more hits. At random intervals, he'll jump into the air like he is throwing shurikens, but he'll be throwing poison in a cone directly in front of you. Step-dodge or run backwards at this point. Even if you touch the poison for a second, it shouldn't cause you to be actually poisoned super quickly. Deathblow one more time and the achievement is yours.